Energy is classed as renewable energy when it is not depleted when used, as in the case of wind power and solar power, or when it is capable of being naturally and sustainable replenished as in the case of biomass energy. Government financial incentives have been introduced to encourage households, businesses and other organisations to switch to renewable energy heating systems to reduce the negative impact which burning fossil fuels has on climate change. Government financial incentives have been introduced for solar PV, biomass boilers, solar thermal water heating systems, ground source heat pumps and air source heat pumps. These financial incentives, which have been introduced to encourage the uptake of renewable energy heating systems by householders, include the Feed-in tariff and the Renewable Heat Incentive. Feed-in Tariff (FIT) Scheme was introduced in April 2010 and pays two types of Feed-in tariff for installing renewable energy systems; the Generation tariff rewards you for the total amount of electricity you generate and the Export tariff pays an additional amount for any the electricity you don’t use. Feed-in tariff rates are reviewed every three months but they are guaranteed once you have been accepted into the Feed-in tariff scheme. Feed-in tariffs also rise in line with the Retail Price Index (RPI). Feed-in tariff rates are reviewed every three months but the rates from 1st July 2014 were 14.38 pence per kWh (kilowatt hours) for the generation tariff and 4.77 pence per kWh for the export tariff. Renewable energy Feed-in tariffs are payable for 20 years and are not taxable. The renewable energy Feed-in tariff scheme (FITs) applies to solar PV as well as other sources of renewable energy such as wind turbines, hydroelectricity, anaerobic digesters and micro combined heat and power systems (CHP). Solar PV, or Solar Photovoltaic, panels absorb solar energy from the sun which they convert into electricity. Solar PV panels work in daylight so they don’t need direct sunlight to generate electricity and they still work on cloudy days to create renewable energy. With solar PV panels generating part of the electricity you use in your home you don’t need to buy as much electricity from your energy provider, so you can save on your electricity bills. You can also claim the Government’s Feed-in tariff payments for generating renewable energy, which are based on the amount of electricity your solar PV panels generate. Wind turbines work when the wind turns blades which are linked to an internal generator. The generator produces electricity and the stronger the wind, the more electricity is produced by the wind turbine, increasing the amount of renewable energy your wind turbine generates. The largest domestic wind turbines are free-standing machines which are mounted on 10 – 25 metre masts in suitably exposed positions and they generate between 2 kW and 6 kW (kilowatts). Smaller roof mounted wind turbines with an output of 1 kW to 2 kW are more common but less effective. Renewable Heat Incentive (RHI) was introduced to encourage householders, businesses and other organisations to switch to renewable energy heating systems as a way in helping the UK Government to achieve its target of 12% of heating being produced by renewable energy by 2020. Renewable Heat Incentive has been hailed as the first scheme of its kind in the world to promote the generation and use of renewable energy. Not for profit organisations which can apply for Non-Domestic RHI tariffs include community organisations where a group of householders team together to install a renewable energy heat generator from which they all benefit. Householders will share the renewable energy the system generates and they will share the Non-Domestic RHI tariff payments. Domestic RHI is considered such an important part of the Government’s energy policy in promoting the generation and use of renewable energy that the Department of Energy and Climate Change (DECC) described it as ‘the first step in transforming the way we heat our homes’. For a typical four bedroom house with an annual heat demand of 25,000 kilowatt hours per year, the annual Domestic RHI tariff payment would be £3,050 if you switched to a biomass boiler. (25,000 kWh x 12.2 p = £3,050). In this example the Domestic RHI tariff would be paid at the amount of £762.50 every three months for seven years for generating your own renewable energy. Biomass boilers generate renewable energy by burning wood to provide heating and hot water, rather than using heating oil, gas or LPG and as a result, biomass boilers tend to be somewhat larger than conventional central heating boilers. 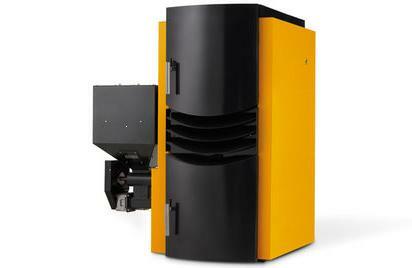 Modern condensing biomass boilers are designed to use wood pellets as fuel but in many other respects they operate just like gas and oil-fired boilers. Biomass fuel wood pellets are fed from an integrated hopper, through an auger (screw type conveyor) into the combustion chamber where they are burned. This produces hot gases and the heat from these gasses is transferred to water which is distributed around your home’s central heating system and to provide hot water through your taps. Biomass renewable energy is 50% cheaper than LPG – Biomass boilers are ideal for farms and rural homes which cannot access natural gas because of the relatively high cost of heating oil and LPG, compared to biomass wood pellet fuel. Using December 2013 prices, biomass energy costs around 4.3 pence per kilowatt hour (kWh), which makes it over 30% cheaper than heating oil (6.4p/kWh) and 50% cheaper than LPG (8.6p/kWh). Biomass renewable energy heating systems are a mature proven heating technology which has been used extensively in Austria, Denmark and Finland. The Carbon Trust referred to biomass renewable energy as one of the few “cost effective and practical ways to provide space heating and hot water from a low carbon source”. Solar thermal water heating systems use solar energy from the sun to heat water which can be used in your home’s hot water supply. Although some solar thermal water heating systems are designed to provide both hot water and space heating, only those systems which provide hot water only, attract Domestic RHI tariff payments. Solar thermal water heating systems are very efficient but at times when they are unable to provide hot water, a back-up system such as central heating or an immersion heater will be required. Domestic RHI tariff payments are only payable for flat plate and evacuated tube versions of solar thermal water heating systems which generate renewable energy. How do solar thermal water heating systems work? 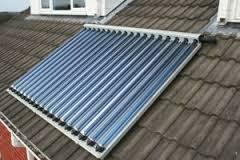 Solar thermal water heating systems have solar collectors fitted onto the roof which have copper pipes inside containing ‘solar fluid’. This solar fluid absorbs heat from the sun and transfers it to water via a system of coils and pumps. The hot water produced can be used as part of your domestic hot water supply and the solar fluid is then pumped back to the solar collectors on your roof to be re-heated for the process to continue. 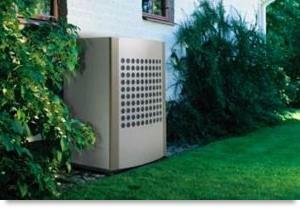 Ground source heat pumps take stored heat energy (known as ground source heat) from underground and use it to provide space heating and to provide domestic hot water. A system of pipes called a ground loop is buried in a trench or in a vertical borehole and the fluid inside these pipes absorbs heat from the ground around it. Ground source heat pumps are very reliable because the sub-surface soil and rock in the UK remains at around 10º centigrade throughout the year and that is sufficient for these renewable energy systems to provide a sustainable source of renewable energy. Whereas the use of fossil fuels such as gas and heating oil extract heat by burning it and giving off potentially harmful carbon emissions, ground source heat pumps merely move the heat energy from underground to your home’s central heating system. As a result, ground source heat pumps generate renewable energy without you having to worry about the lack of sunlight, falling supplies of fossil fuels or increasing carbon-based fuel prices. Air source heat pumps take heat energy from the air outside in the same way that ground source heat pumps take heat energy from below the ground. In fact air source heat pumps work in a similar way to refrigerators, only in reverse. Both air source heat pumps and ground source heat pumps use electricity to pump heat into your home heating system, whether to create space heating via radiators or for your domestic hot water supply. Although both types of heat pump use electricity, for every one kilowatt hour of electricity they use, they can generate up to four kilowatt hours of renewable energy in the form of heat. This effectively makes heat pumps up to 400% efficient at generating renewable energy. Air source heat pumps and ground source heat pumps will only qualify for Domestic RHI tariff payments if they distribute the renewable heat energy they generate via a wet system such as a network of pipes and radiators containing water. Air source heat pumps generate reliable, sustainable and renewable energy by simply moving heat from the air to your domestic central heating system because they are capable of generating renewable energy for your home even when the temperature outside is as low as minus 15ºc. Consequently, renewable energy generated by air source heat pumps is not affected variations in the amount of available sunlight, limited supplies of fossil fuels or rising fuel prices. Also, the installation cost of an air source heat pump is much lower than the cost of installing a ground source heat pump because no ground loop is required. This lower installation cost is however, reflected in lower Domestic RHI tariff payments for air source heat pumps compared to ground source heat pumps. Why is renewable energy important to us? Scientists are convinced that the earth’s surface temperature is rising and whether it is due to climate change, global warming or it is a cyclical process, western governments have started to act in promoting renewable energy. According to the Office of National Statistics, as a result of burning fossil fuels, greenhouse gas emissions in the UK were 656.3 million tonnes in 2102, with over 30 billion tonnes of carbon dioxide emissions around the world. And although there are climate change sceptics who argue against this, most people accept that there is a scientific link between the use of fossil fuels to generate energy and rising global temperatures. Encouraging the generation of renewable energy such as solar power, wind power and biomass energy is considered a positive move towards limiting the effects of global warming and climate change. Since ‘doing nothing’ appears not to be an option, western governments are introducing financial incentives such as the Feed-in tariff and the Renewable Heat Incentive to encourage the generation of renewable energy in homes and businesses. In addition to these schemes to promote the generation and use of renewable energy, the UK Government has introduced measures to assist householders to improve the energy efficiency of their homes. These Government financial support schemes include the Green Deal and the Energy Company Obligation. Green Deal is an attempt to encourage householders to improve the energy efficiency of their homes by providing Green Deal loans to pay the initial installation costs of energy saving home improvements. Green Deal loans are repaid out of future savings in energy bills which are achieved by improving the energy efficiency of your home. Although Green Deal does support the installation of renewable energy heating systems such as biomass boilers, its main intention is improve the energy efficiency of the domestic housing stock in the UK. Green Deal loans are available for new condensing gas and biomass boilers, wall, window and roof insulation, solar PV, solar thermal water heating systems, ground source heat pumps and air source heat pumps. The Green Deal cash back scheme provides an additional £500 for householders who have purchased their property within the past 12 months. Energy Company Obligation (ECO) runs alongside Green Deal and provides financial assistance for the installation of energy saving home improvements for low income households and householders living in properties which are ‘hard to treat’. The Energy Company Obligation initiative was introduced mainly to tackle fuel poverty. CSCO provides at least 15% of available ECO funding for the installation of energy efficient home improvements in low-income households in rural areas. CSO provides funding for difficult to install home improvement insulation measures (known as ‘hard to treat’ measures) which cannot be funded by Green Deal. These include solid wall insulation which fails to satisfy Green Deal Golden Rule criteria because it is expensive to install compared to worthy, but relatively low savings in energy bills. AWO, sometimes referred to as the Affordable Warmth scheme, provides funding to pay for the installation of efficient condensing gas boilers, cavity wall insulation, loft insulation and solid wall insulation into low income, private households. The Affordable Warmth scheme helps both homeowners and tenants who receive certain state benefits and who live in poorly heated or poorly insulated homes. When the Affordable Warmth scheme was first introduced in early 2013, energy efficient condensing gas boilers were installed for most qualifying households free of charge and contributions were only required for additional work not covered by Affordable Warmth scheme. As the Affordable Warmth scheme has progressed, funding amounts awarded to installers have been reduced to a point where either contributions are now required or AWO applications are combined with other funding schemes such as Green Deal. More detailed information about the Affordable Warmth scheme can be found by visiting www.affordablewarmthscheme.co.uk.